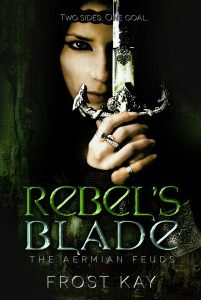 Secretly trained, swordsmith Sage Blackwell steps up to run her family’s forge when her father falls ill. Sage desires to help the neglected Aermians but is bound by duty to provide for her own… Until, that is, she’s offered a chance to make a difference. Sage knows the risks; imprisonment or death, and yet, she’s still willing to take them to protect her family. But when plans unravel, Sage finds herself facing the devils themselves, her sworn enemies, the princes of Aermia. Tehl Ramses is drowning; crops are being burned, villages pillaged, and citizens are disappearing, leading to a rising rebellion. As crown prince, and acting ruler, Tehl must find a way to crush the rebellion before civil war sweeps through his beloved kingdom. He’ll do whatever is necessary to save his people. Yet, his prisoner is not at all what he expected. ONE STORY. TWO SIDES. ONE GOAL: SAVE AERMIA.